America’s beverage companies continue to deliver for consumers in communities across America. By delivering more beverage choices, smaller portions, fewer calories and clear calorie labels, our companies are making it easier for consumers to choose the drink that is right for them and their families. Building upon previous industry initiatives, America’s leading beverage companies will work with Chicago Mayor Rahm Emanuel and San Antonio Mayor Julián Castro to launch a new Calories Count™ Vending Program. This vending machine program provides clear calorie information, encourages lower-calorie beverage choices and reminds consumers that calories count in all the choices they make. 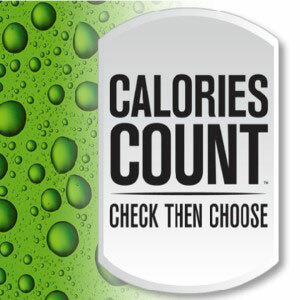 The Calories Count™ Vending Program will be launched in municipal buildings in the cities of Chicago and San Antonio beginning in 2013 and then made available to customers nationwide. 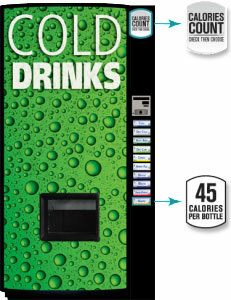 Add calorie labels to the selection buttons on beverage vending machines to show calorie counts per beverage container.